The Ethnomusicological "We" and "Them"
This chapter is both subjective-personal and objective-general. It is my opportunity to reflect upon more than four decades of personal involvement with world music ensembles, initially as a student, then as a (sometimes reluctant) teacher, and finally as an ethnomusicologist overseeing such projects. Although I focus here upon the ensemble within an American academic setting, we should acknowledge and appreciate similar activities outside academe, such as at the Naropa Institute (Boulder, Colorado), the World Kulintang Institute (Los Angeles, California), and Gamelan Sekar Jaya (El Cerrito, California), as well as outside the United States, including at the Chinese University of Hong Kong, La Cité de la Musique (Paris), Osaka University (Japan), the School of Oriental and African Studies (London), and the Tropen Museum (Amsterdam). Although I intend my observations to have wider application, my immediate purview is circumscribed by institution and by nation: I examine world music ensembles as found at colleges and universities in the United States. The comments and observations following draw upon past and ongoing experiences at a number of American institutions, including the University of Hawai'i at Manoa, UCLA, U.C. Santa Cruz, U.C. Santa Barbara, Oberlin College, the University of Miami, and Beloit College. They are further informed by sojourns overseas, including to the University of Cologne (Germany), the University of the Philippines (Quezon City), the University of Malaya (Kuala Lumpur), Institut Seni Indonesia (Yogyakarta), Musashino College of Music (Tokyo), and the Australian National University (Canberra), as well as other locations specifically cited in the chapter. They are also influenced by my interests in the pedagogical developments of ethnomusicology, world music, and multiculturalism in the American academy (Trimillos 1988b, 1990; Volk 1998). It is my intention to attempt a self-reflexive critique of ourselves and our field. The willingness to interrogate subject as well as object is a relatively recent and welcome development encouraged by cultural studies and recent developments in anthropology. There has always been a need to locate ourselves and our own agency within the domain of study, which has clearly undergone change. The American world music ensemble at the beginning of the twenty-first century operates in a different space than it did in the 1960s. We will briefly revisit that earlier space. The world music ensemble, an innovation by Mantle Hood at UCLA in the late 1950s, began as a study group. It originated as a means for understanding the music of another culture, that is, accessing the musical other. Its purpose was explicit in its original designation as study group, which emphasized understanding rather than presentation in intent. The study group is my point of reference for the term ensemble. However, Seeger does not stop with the argument that performance can enhance reflexive, word-based scholarly inquiry. He advances a corollary notion: learning (and, by implication, teaching) through performance commands parity with, if not superiority to, the logocentric processes of conceptualization, reflection, and analysis, which he characterizes as "armchair study." The primacy of these processes he assigns to the first epoch of the field. The corollary to the above argument is that "Precept and objectivity have their place in learning, but there is more than one reason to believe that it is second to example. And in all example, the subjective element—at least in the humanities—is as important as the objective" (ibid. ; emphasis mine). It could be argued that during the ensuing three decades this corollary has become a second and independent tenet of the "credo," evidenced by the significant number of non-ethnomusicology students who populate study groups and, remarkably, by the presence of world music ensembles in institutions without ethnomusicology programs. A notable model is the World Music Center at West Virginia University (Morgantown), an institution that supports Caribbean, African, and Asian music performance ensembles but has no resident ethnomusicology faculty to provide broader contextualization or scholarly reflexivity about these genres. Neither world music nor ethnomusicology is featured in the university's curriculum. The center's 2001 mission statement claims, "The philosophy behind the World Music Center is to help students gain a better understanding of people and traditions that are different from our own Western culture" (www.wvu.edu/~music/special.htm; emphasis mine). She acted upon that concern. Rather than seeking performance teachers from abroad, she drew them from the multicultural Asia-Pacific communities of Hawai'i, a decision she considered an "important step in integrating the community-at-large into the ethnomusicology program" (ibid. : 211). The study groups not only brought music of the Other to the academy; they also served as a mainstream validation for these musics, an important statement for ethnic minorities in the throes of assimilation to American society. Barbara Smith organized study groups for both musical and social reasons, a pedagogical stance that parallels the major interests of our discipline. Thus a forty-year trajectory reveals development from a single academic rationale to multiple ones responding to concerns of multiculturalism, alternative modes of knowledge acquisition, cultural and ethnic advocacy, aesthetic and artistic pluralism, and community outreach, to name a few. In my view, the multiplicity constitutes a synchronic continuum between two contrasting polarities concerning the academic value of the study group, 1) as adjunct to scholarly inquiry, and 2) as a self-contained, independent, aesthetic and expressive activity. The multiplicity of rationales certainly reflects a change in the American social environment since the 1960s, with an expanded civil rights movement, the social issues raised by the Vietnam war, the specter of ethnic cleansing, and global electronic linkages. The present teaching environment itself is informed by at least three major developments. The first is the trope of the pluralistic, multicultural America. The second is the concern for academic relevance, that is, how the study group supports notions of academic goals and priorities. The third is a higher level of public essentialist rhetoric, part of a current mood of political correctness that carries serious implications for our field. All three developments comprise subtexts for this discussion. Therefore, I give each some consideration here. Pluralism is both a reality and an aspiration. Demographic studies and census data attest to its statistical significance. The vision of the American multicultural heterotopia has been a theme in education since the 1970s, and it is a major part of educational debate today (Nussbaum 1997). Given America's history of racism, the vision has not yet been fully achieved as social reality. To its credit, ethnomusicology as a multicultural enterprise predates this educational vision. When multiculturalism was articulated nationally in the 1970s, ethnomusicology stood ready to provide musical content, to fill in the cultural world map, as it were. Performance of world musics as an experience of the Other validates and empowers, both goals of multicultural education. For some, the ensemble provides an avenue for actualizing a pluralist vision and contributing to the multicultural reality. Relevance is a central theme for institutional justification and pedagogical rationale. The study group, like every component of a curriculum, is continually challenged to demonstrate long-term relevance and usefulness to the academy. Justification is particularly critical at sites where ensembles are staffed by part-time or non-tenure track faculty or when financial resources are limited. Although Hood's original intent was satisfactory for the 1960s, at the onset of the twenty-first century it may no longer be sufficient. The contemporary rationale needs to reference diverse aspects of the experience. For example, the study group certainly resonates with current music learning theory, including Gardner's multiple intelligences (1999), with general critiques of the academy (Kingsbury 1988), and with national priorities for the arts in education (Down 1993). However, the case for its raison d'être rarely employs an expanded rationale. Granted, the study group is only one of the identities for the world music ensemble at present. As evident by the West Virginia program, it may no longer exist solely as the handmaiden to ethnomusicology and its exercises in reflexivity. Essentialism presently commands a national foreground beyond academe. The awareness of cultural pluralism and the hope for multiculturalism raise the difficult issues of entitlement and authenticity. The term authenticity applied to the object is problematic; I have discussed this issue elsewhere (1995). However, I use the word without qualifiers here to mark the spectator position advanced by Balme (1998), that is, the authoritative or the credible from a consumer viewpoint. For our purposes the student, the personnel committee member, and the concert series director are all part of the academy's consumership. The appropriateness of any individual speaking for a culture or a people has come under intense scrutiny, bringing greater attention to the identity of the messenger. Widely discussed in academe (see, for example, Brunner 1998; Roof and Wiegman 1995; Spivak 1988), essentialism has been identified as a means for empowerment, often for people of color. Such discussions have been notably absent from ethnomusicological forums. Although essentialism was raised almost four decades ago in reference to African-American music, a serious debate on essentialism in our field has yet to emerge. Any essentialist position has far-reaching implications for the study group, and particularly for its teacher, whose persona comprises a major theme of this chapter. Consideration of the teacher suggests provocative parallels with the relationship of message and messenger. The teacher is the critical link for the study group, the individual who delivers musical and cultural knowledge of the Other to the American student. As one who has been both part of the study group's historical development and one of its messengers, I consciously conflate subject and object, the "we" and "them," the "ours" and "theirs," in the course of this discussion. Multiple positionalities are unavoidable in the cross-cultural work we do. Invoking them here is an attempt to convey the complexity of this work. I begin with a most essentialist conflation of subject and object, my gaze upon myself as study group teacher. In the first scenario, I analyze my own agency within two variant locales for Philippine music. In the second, I problematize myself, koto musician and teacher, as the object of gaze by various populations in Hawai'i. The Philippine Ensemble: Teaching Which Heritage to Whom? In this first narrative, I contrast teaching the Philippine Ensemble in two different locales during the 1980s: the University of Hawai'i and the University of California, Santa Cruz. The format and content of the ensemble were the same at both campuses. The study group focused upon the Lowland repertory of the rondalla string band, which functions de facto as the national folk music. The rondalla references the Spanish colonial heritage of the Philippines, both in its material culture and musical styles. Although the ensemble concentrated on instrumental repertory, I also taught songs with texts in Tagalog, the national language. A source for my knowledge of the rondalla and its repertory is my personal background, as I come from an emigrant Filipino enclave in the then-agrarian environs of San Jose, California. It was the music I heard and played as part of a Filipino-American family, and the music has personal significance as part of my cultural heritage. The kulintang, a gong-chime ensemble of six to seven players from the Muslim south of the Philippines, served as a Southeast Asian contrast to the Hispanicized rondalla. It has stylistic and organological connections to the more elaborate gamelan orchestras of Indonesia. Musical ties of the kulintang to insular Southeast Asia include: a tuning system not based upon equal temperament or upon a system of standard pitches, a praxis that requires improvisation, and a repertory unfettered by an indigenous notation system. Other ties are contextual: kulintang represents Filipinos who successfully resisted Spanish and American colonization and, like its people, has been subjected to exploitation and misrepresentation by a Lowland Filipino hegemony. My source for this knowledge is my study of Tausug kulintang and its repertory as part of graduate field research in the Sulu archipelago of the southern Philippines between 1963 and 1968. The ensemble has personal significance as part of my first fieldwork experience. In both Santa Cruz and Hawai'i my major goals for the study group were the same: performance competence in Filipino musics, experience with standard repertory, and an entrée for cultural understanding. I found, however, that the two sites required different approaches. For this discussion of the three goals, I focus upon the rondalla, leaving an extensive consideration of kulintang for another opportunity. The learning environments were different in Hawai'i and Santa Cruz, in part because of contrasting social histories. In Hawai'i with its multicultural and plantation history, there was already general recognition of Filipino culture and an aural familiarity with the rondalla. Within the racial hierarchy of the Hawaiian Islands, Filipinos have historically ranked below Japanese, Chinese, Koreans, and Caucasians (haole), and, like the Portuguese and Samoans, they have often been subject to negative racial stereotyping. Most Hawai'i-reared students (self-identified as "local") in the ensemble came with this history, although they reflected diverse ethnicities: they were Japanese, Korean, Hawaiian, Vietnamese, Chinese, and haole as well as Filipino. Nonlocal students, primarily mainland Americans, foreign students, and military dependents, were generally ignorant of the island racial hierarchy and considered Filipino culture simply another culture with which to become familiar. In Santa Cruz I found a general ignorance of Filipino culture, in spite of the existence of a significant resident community. None of the study group students came from the Santa Cruz area; they had minimal contact with the region's cultural diversity or its ethnic minorities. Unlike Filipinos in Hawai'i, those in California are subsumed in the general category of Asian American, a construct that arose from the civil rights and related activist movements of the 1960s. The number of students of Filipino heritage on campus was small; I had none in the group. Diversity was represented by one student of Jewish background. Gender diversity was completely lacking; I found it a novel (and singular) experience to teach a music class that was completely male and white. Among the Hawai'i students, I found uncritical acceptance of the rondalla as Filipino and an aural attraction to kulintang as a Filipino but exotic Other. Filipino music and dance are regularly part of multicultural public presentations; a number of Filipino performance troupes exist in the community, and the music is frequently presented on radio and television broadcasts. For Hawai'i students, then, the identity of rondalla music as Filipino was reinforced in the general community. In Santa Cruz, however, no wider soundscape for rondalla existed; the study group constituted the students' principal, if not only, point of contact with the tradition. Its "Mediterranean" quality coupled with the students' unfamiliarity with the genre occasionally led to questions about its authenticity as an Asian music. "It's too Western to be from Asia," one remarked. 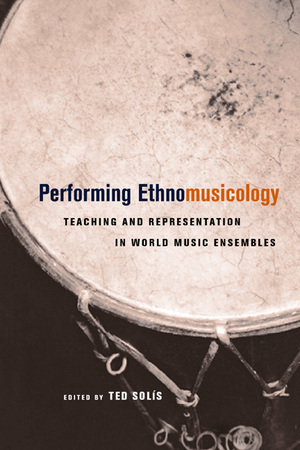 Performing Ethnomusicology is the first book to deal exclusively with creating, teaching, and contextualizing academic world music performing ensembles. Considering the formidable theoretical, ethical, and practical issues that confront ethnomusicologists who direct such ensembles, the sixteen essays in this volume discuss problems of public performance and the pragmatics of pedagogy and learning processes. Their perspectives, drawing upon expertise in Caribbean steelband, Indian, Balinese, Javanese, Philippine, Mexican, Central and West African, Japanese, Chinese, Middle Eastern, and Jewish klezmer ensembles, provide a uniquely informed and many-faceted view of this complicated and rapidly changing landscape. The authors examine the creative and pedagogical negotiations involved in intergenerational and intercultural transmission and explore topics such as reflexivity, representation, hegemony, and aesthetically determined interaction. Performing Ethnomusicology affords sophisticated insights into the structuring of ethnomusicologists' careers and methodologies. This book offers an unprecedented rich history and contemporary examination of academic world music performance in the West, especially in the United States. Ted Solís is Professor of Music in the School of Music at Arizona State University. 1. Subject, Object, and the Ethnomusicology Ensemble: The Ethnomusicological "We" and "Them"
13. Community of Comfort: Negotiating a World of "Latin Marimba"